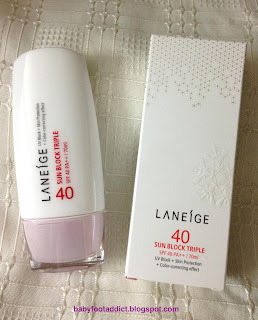 So here's my review on the 2nd Laneige item I bought and used - Sun Block Triple SPF 40 PA++, 70ml at RM90. Let's start with the packaging and presentation. The box is very interesting as it added embossed graphic and metallic print aside from the normal printing. A shape that somewhat looks like snowflake is embossed in front and side. I just don't understand the snowflake-looking shape's connection with sun block. The product's packaging itself is in plastic tube with a twist cap. A bit inconvenient when in a hurry, specially for us working women who have to quickly finish our skincare and makeup every morning, in addition to preparing our child for school. It would have been better if it comes in a flip top or in a one-pull cap. The product claims to have 3 functions: blocking UV rays, relieving photo-aging and correcting skin tone. And according to the beauty consultant, it also serves as a make-up base. Main ingredients include cyclopentasiloxane, titanium dioxide, ethlyhexyl methoxycinnamate, butylene glycol, zinc oxide and ethyl dimethicone, contains parabens. I've started using it for a few days, together with my daily morning skincare and makeup routine. 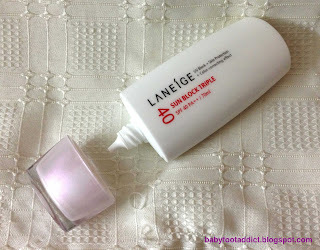 After my pore minimizing moisturizer, I apply the sun block then my RMK liquid foundation. The sun block smells nice. However, although the ingredients surely serve a good function in blocking the sun, I am quite disappointed with the texture and blending properties. It's a bit thick and leaves an obvious white film, probably because of the titanium dioxide. 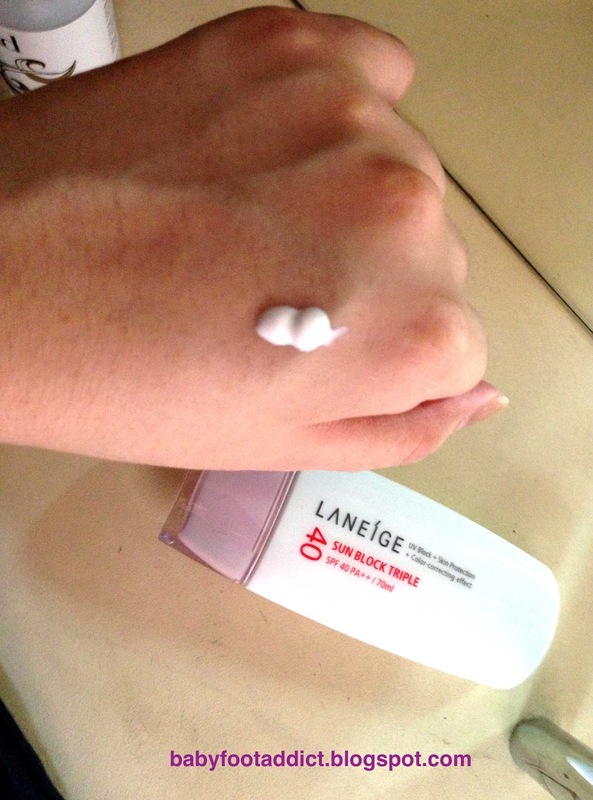 Also difficult to spread and blend even on top of a moisturizer. Considering that it's supposed to have color-correcting properties, I don't think that making my face whiter than my neck would be the right effect. Lucky I have a good liquid foundation so I get my correct tone again after applying on top of the sun block. I hope Laneige will improve on this, or better yet, launch a CC cream that will be better than this item. 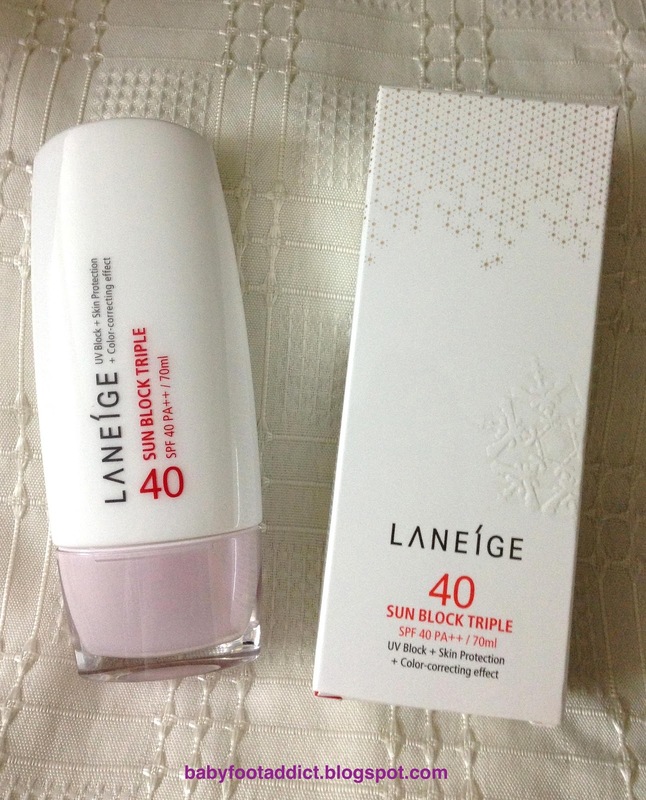 The product is not bad as the 3 main claims are very great functions, just need to improve texture and blending properties and maybe a more convenient bottle. Well, I will still continue to use it and see how effective it will be against protecting my skin from the sun and correcting my skin tone. Over the year, I've developed tiny spots on my right cheek due to sun exposure while driving. And now that I am working further from my home than before, I will be even exposed longer to UV rays on the road. If it shows good results on my spots and skin tone then I probably would try to live with the unsatisfactory texture and blending.